Annie McGann sent this to me by email recently. 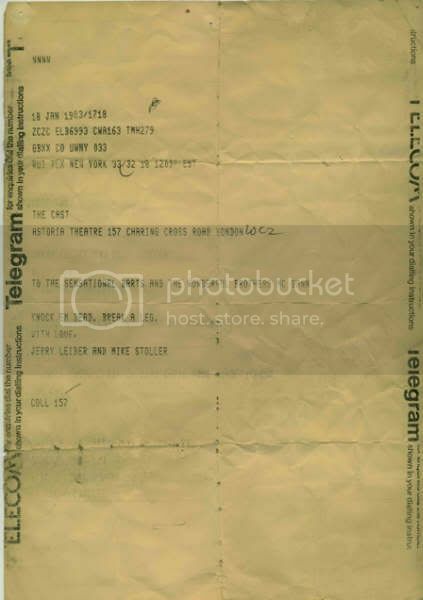 It's a scan of a telegram that Paul and his brothers received on opening night of Yakety Yak. It's dated 18 January 1983. How incredibly cool is that!? Also, if you do want to post this somewhere else (i.e. at Live Journal or PMEB or Utopia... wherever) please let me know so I can tell Annie, and please also mention that it was sent by Annie to me.... Thx. Oh, what a lovely bit of musical theatre history. Thank you, Jenn & Annie!!! [i]so very much [/i]for posting it here. May as well add these program covers in.